Electrical appliances are defined as devices which use electricity to perform specific functions. A wide range of such appliances include refrigerators, wine-coolers, washing machines, tumble dryers, vacuum cleaners, steam mops, shavers, trimmers, water heaters, air conditioners, air coolers, heaters, fans, rice cookers, bread makers, toasters, irons, and juicers. A large number of companies across the world manufacture and sell such appliances, providing customers with a range of options. One of the primary drivers of the market is higher standards of living, especially in the Asia Pacific region. As the average monthly income of households has increased, they have been able to make purchases beyond the basic human necessities. This has led households to purchase electrical appliances, which have historically been looked upon as luxury items. Another major factor driving the global electrical appliances market are the lucrative offers and the easy availability of credit schemes to purchase them. In fact, the purchase decision of nearly 70% of potential customers is positively influenced by the presence of such offers. A major threat facing the global electrical appliances market is the fluctuations in the supply of raw materials. While companies are capable of absorbing considerable amounts of fluctuations in the product price, the instability of raw material supply can affect production as well as demand, and hence, the associated revenue, profits, and R&D investments of the companies. Another threat includes the rise of smart appliances, robots, and connected living. Electrical appliances specifically designed for such purposes present a threat of extinction to the conventional models of various electrical appliances. 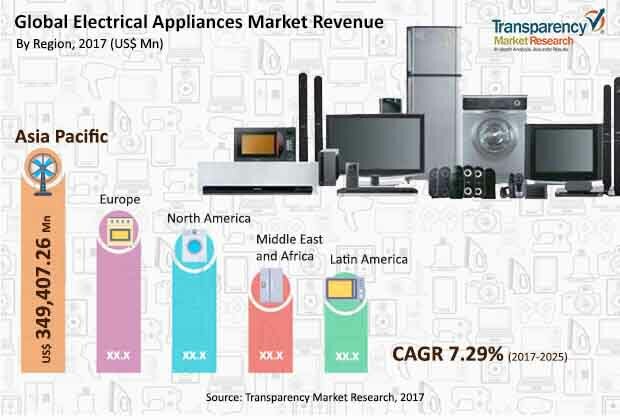 Another major restraint of the global electrical appliances market is the consistent and considerable R&D investment required to develop new, more efficient, environment-friendly, smart, and connected appliances. It is a highly competitive market coupled with increasingly stringent government regulations regarding emissions of environmentally harmful chemicals. In such a scenario, the constant improvement of products is important, though this is mostly possible only by larger companies such as Whirlpool Corporation, Haier Group, and LG Electronics Inc. The major opportunities in the global electrical appliances market exist in product differentiation and new product development. Almost all the companies focus on providing a wide range of products to meet the needs and price affordability of consumers from different economic strata. This in turn creates the need for product differentiation. Companies try to provide this through the different features offered in the appliances. For example, a 1-door refrigerator is more affordable for consumers belonging to the lower end of the economic strata whereas the high-cost side-by-side refrigerators are offered to consumers from the higher end of the economic strata. In terms of new product development, the forecast period is expected to witness the rise of smart and connected electrical appliances. These appliances go a long way in easing the work of households by giving them the ability to remotely control and operate the products through mobile phone applications. In terms of different supply chain segments, retail chains have an opportunity to expand and sell higher number of electrical appliances. Similarly, an opportunity is emerging for new raw material providers. The global electrical appliances market is defined by continuous improvement to products undertaken by companies. This generally means the introduction of new technology in products on a regular basis. For example, Whirlpool Corporation has announced that in 2018, it will become the first appliance maker to incorporate Apple Watch functionality in the company’s products. On the other hand, Philips Electronics N.V. has focused on adapting its appliances to the needs of the African population, a majority of which lives off-grid. In the meantime, Gree Electric Appliances Inc. is focused on automating its production processes. Separately, Samsung has focused on differentiating its designs from those of its competitors. To a lesser extent but an equally important strategy of companies is to acquire rivals or newly-started competitors, either to gain new technology or to expand geographically. For example, Midea Group recently acquired KUKA AG, a leading global supplier of intelligent automation solutions, for its technology. It also acquired the Home Appliances business of Toshiba for geographic expansion. Similarly, in late 2016, AB Electrolux acquired Kwikot, a leading water heater company in South Africa. The acquisition not only strengthened its expertise in the home comfort area, but also contributed to improving its overall market reach in Southern Africa. On a similar note, Panasonic Corporation acquired Hussman, the U.S.-based industrial refrigerator and freezer display case manufacturer. The global electrical appliances market has existed for a long time and during this time, has been dominated largely by manually operated products. However, the last few years have seen the rise of autonomous products where functions are carried out at the touch of a button. This has been matched by additional functionalities added to the products over a period of time. However, the outlook in terms of the products sold, is expected to be different during the forecast period. The development of smart and connected appliances is expected to provide an impetus to the market. The market is expected to witness higher growth rate in developing countries, especially those in the Asia Pacific region. This is expected to be driven by the first-time purchase of electrical appliances by majority of the households in the region. Meanwhile, replacement demand is expected to be the major driver of demand in the developed regions of North America and Europe. The average lifespan of an electrical appliance is around 10 years, after which it needs to be replaced. In 2016, Asia Pacific generated the largest demand for electrical appliances and this trend is expected to continue during the forecast period. The global electrical appliance market is a relatively unorganized market with the top players accounting-for ~30% of the total market. Such companies include Haier Group, BSH Bosch & Siemens, Midea Group, Whirlpool Corporation, AB Electrolux, Gree Electric Appliances Inc., LG Electronics, Samsung Electronics, Panasonic Corporation, Koninklijke Philips N.V., Godrej Group, IFB Industries Limited, Midea Group, Hitachi Limited, and Glen Dimplex Group. The rest of the market is captured by local and regional players. These companies may not have the strength to expand into different regions and countries; however, it is difficult for multinational companies (MNCs) to grab share of national markets from such players.